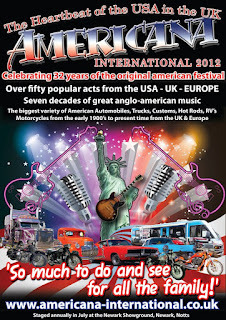 The tried and tested formula of the Americana International is the key to the success and longevity of this festival as once again thousands of enthusiasts flocked to the wide open spaces of the Newark Showground on the first full weekend of July. 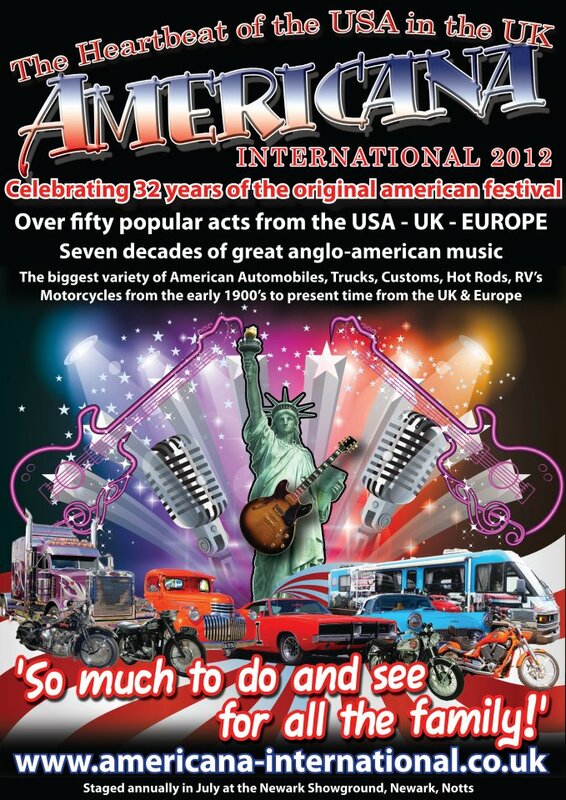 The term Americana can have many different interpretations but for the 32nd straight year this self-professed lifestyle event blends several strands of music with the grandeur of the automobiles, motor cycles and elaborate recreational vehicles that form a vision of post-war American culture. The music is a mere snapshot of what has originated from the U.S. over the last fifty years and is centred around mainstream country, rockabilly and the wide spectrum that formulates the term rock n’ roll. The vast range of artists on show from both sides of the Atlantic encompass highly credible acts and those who steer their talent in an imitative direction but provide a mixture to entertain an all-age inclusive crowd in an affordable way. It has to be said from a personal viewpoint, a fair proportion of the acts are of mere passing interest, but, as on numerous previous visits to this three day festival, there are usually around a dozen artists that have sufficient merit to warrant further scrutiny. Some are noted beforehand while you normally have the usual festival experience of an unexpected artist raising their own profile in your live music appreciation. The Friday of this year’s festival did take a while to ignite, and not just due to the presence of the loathsome wet weather afflicting yet another summer outdoor activity, but by the time the three earmarked bands took to the main stage, the rain clouds kindly took their content elsewhere. The first of what turned out to be a San Diego double header saw the Bayou Brothers deliver their interpretation of Cajun, Zydeco and blues in a rare festival serving of this style of Americana music. Though originating from the sunshine state, the band led by accordion playing vocalist John Chambers have fully embraced the Louisiana sound and put on a show that couldn’t fail to impress those who perhaps were looking for a little deviation from pure guitar based music. The added entertaining feature of a rubboard, expertly demonstrated by Judy Seid, assisted the band in playing tunes such as ‘Chilli Momma’, ‘Alligator Waltz’ and the ever popular ‘Toot Toot’. The set saw a little mid-way deviation where the blues element of their performance surfaced through the delta inspired voice of highly respected guest, Lazy Lester. His interpretations of ‘Scratch My Back’ and ‘You Better Listen’ left you in no doubt of the credentials of this Hall of Fame nominee. The link between the Bayou Brothers and the next artist was the Eve Selis Band bassist, Rick Nash who doubled up to help out his fellow San Diego residents. Eve Selis in fine voice again. Eve Selis is a regular visitor to the Americana International and her 2012 full band tour conveniently included successive weekend festival shows at the Maverick in Suffolk and here in Newark a week later. Having witnessed three appearances of this band in a week, though there were contrasts in the set list, the high quality of each performance was easy to compare. The opening track ‘Rubber and Glue’ and ‘Russellville’ were restored to the set and once again the vast majority of the numbers were from the recent ‘Family Tree’ album which is continuing to flourish with every listen, both live and on record. Eve’s fantastic personality absorbs a festival crowd and she never misses an opportunity to win over new admirers. The surprising omission from the set of ‘Ballad of Kate Morgan’ denied drummer Larry Grano his moment of vocal fame but his percussion skills are an essential element of the numerous strong songs such as ‘Heart Shaped Tattoo’, ‘One Day At A Time’ and ‘Stop The Train’. So a personal live farewell to Eve and her band this year but good to be left with the memories of ‘Don’t You Feel Lonesome’, ‘Witness to Your Life’ and ‘Ain’t Got Nothin’’, all songs added to a personal 2012 summer soundtrack. The main stage closed on the Friday evening with a performance from respected UK country band The Diablos. This is one of the few bands witnessed from the British club scene that has made an impression and they mix original material with interesting covers such as the Allman Brothers instrumental ‘Jessica’. The band’s standout track was ‘Truth and Consequence’, a number one on the UK Hot Disc Country Chart. If there were a few more bands around like The Diablos, the club scene may be a little more appealing. The first act on the Saturday to be of interest was the curiosity surrounding the re-appearance of fourteen year old Ellie Dibben on the main stage. Although her set last year was not witnessed, the promoter Chris Jackson was sufficiently impressed to ask her back and perform with her fellow young band. While her age recalls memories of Leann Rimes creating a stir back in the nineties with versions of ‘Blue’ and ‘Cattle Call’, to make observed comparisons would be a little unfair and inaccurate. However there was no problem with Ellie’s vocal skills as she constructed her set around the songs of country teen idol, Taylor Swift. While the label ‘country’ horrifies many when interpreting this type of music, it is important to assess how the genre is going to evolve. To me the bigger problem is not the output from the young Nashville acts which can find its own niche but some of the blatant de-countrified mixing occurring in certain markets. It will be interesting to see how Ellie’s career develops but she is receiving guidance from industry stalwart, PJ Proby who joined her on stage for a duet of ‘Ready, Set, Don’t Go’. On the theme of contemporary country music, much interest was centred on the next band up, the ambitious Scottish based duo Raintown who were making a rare UK live appearance. Apart from various successful bridge building visits to Nashville, the band have produced a highly competent debut release titled ‘Hope in Troubled Times’ which has signalled a drive to take their UK twist on this strand of music to an elevated level and hopefully infiltrate the mainstream. The duo’s live performances are constructed around the infectious harmonies of co-singers, Claire McArthur and Paul Bain who used the forty five minute set to showcase the album almost in its entirety. It’s always useful to include a couple of popular covers into a festival appearance and Keith Urban’s ‘Somebody Like You’ was their contribution alongside a merging of ‘Jackson’ into their own crowd pleaser ‘Love's Got a Hold on Me’. The strength of songs such as ‘Light the Fuse Up’, ‘Ship of Fools’ and the sing along closer ‘Just One Kiss’ will serve Raintown well in their quest to become the UK’s answer to Lady Antebellum. While the British club scene is probably not the best vehicle to develop their live show, it is hoped they can address this conundrum and be more of a live presence throughout the UK as their talents merit it. Two artists with a pure rockabilly/rock n’ roll background created a fair amount of interest on the main stage as the Saturday evening approached. Si Cranstoun, with his brand of light easy listening rock n’ roll pop thoroughly entertained the crowd, swelled by many visiting from other areas of the festival site, and was duly rewarded with the longest line all weekend at the merchandise tent. Mary Jean Lewis returned to the festival after her impressive set last year and added fuel to the theory that musical talent is in the genes, although she humbly accepts a lower profile than her more famous mother, Linda Gail and uncle, Jerry Lee. There is always a danger of a schedule clash at any festival and on Americana’s Saturday evening, the performance of Stacie Collins on a portable stage located on the back of a truck in front of a sprinkling of admirers won over the viewing of established U.S. country band Confederate Railroad on the main stage. In a festival where the country element rarely drifts off a narrow path, the injection of the honky tonk rock n’ blues raucous sound of Stacie and her band gives you a little insight of what goes on in the clubs and bars in Nashville away from Music Row. Once Stacie freed herself from the constraints of the portable stage, she went on to give a dynamic performance that has been the hallmark of her UK shows over the last couple of years. There were no surprises in a set comprising of songs from her two recent albums and a couple of covers that celebrates the history of country and southern rock. The restoring of, personal favourite, ‘Lucky Spot’ to the set after its omission from her recent Leicester show was most welcome but all the Stacie Collins standards were there including ‘Ramblin’’, ‘Baby Sister’, ‘Hey Mister’ and the rock ballad ‘ It Hurts to Breathe’. By the time the band ended with their usual closer ‘Jumping Jack Flash’, those present were almost as exhausted as Stacie. Roll on her continued UK visits in the future. The theme of country and southern rock was continued into the early hours of Sunday morning as Modern Earl, a band with a heavy US/European influence, followed Stacie onto the makeshift stage in this distant covered venue. The four piece band led by Chris ‘Earl’ Hudson delivered a rousing set and managed to create a sound that overcame some of the acoustic difficulties of this adapted location. Quality songs from their recent record, included in the performance, mirrored common themes such as ‘Blame the Bottle’ and ‘Country Love’ while their heritage and influences were reflected in the state anthem ‘Rocky Top Tennessee’ and festival favourite ‘Folsom Prison Blues’. The seventy five year old legendary ambassador of country music, George Hamilton IV, has made the Sunday morning gospel tinged slot his own at the Americana Festival. With his charming tales of living an unconventional life as a country singer – one wife for fifty years- and mixing with many figures of Nashville royalty, George takes you on a sentimental journey while inspiring those up early with traditional songs such as ‘I’ll Fly Away’ and ‘I Saw the Light’. This was a perfect antidote to a night of country rock and a strong reminder of what makes up the broad church of country music. It has been previously mentioned that most festivals spring a surprise and the 2012 Americana personally confirmed why Brian Hughes has such a respected reputation and stands clear head and shoulders above most UK country acts. Finally catching up with his live performance definitely ranked high up alongside some of the touring artists witnessed and created an impression that he may be a little constrained by the UK scene. The strength of his song writing is one of his major assets and there is indication of this being recognised in the wider country community. Brian throws open his influences to the vast landscape of Americana music and makes no secret of his massive respect for Bruce Springsteen and the impact upon his music. His live festival version of Levon Helm’s ‘The Weight’ was probably the best cover of the whole weekend and he backs this up with some wonderfully constructed tracks from his self-penned latest album ‘My Kind of Paradise’ including ‘Damascus Road’, ‘When All is Said and Done’ and ‘God Bless Friday Night’. The late Sunday afternoon slot on the main stage is usually reserved for an established veteran mainstream country performer and this year’s occupant perfectly fitted that description. Gene Watson has been making country records for over fifty years and was a major star in the industry in the seventies and eighties. The fact that this era just pre-dated the New Traditionalist movement, which altered the landscape of country music, suggests where Watson’s sound resides and the laid back countrypolitan ambience from his performance resonated well with those in attendance. He is a fine singer who in someway defines an era and the wealth of country hits he performed including numbers ones’ ‘Paper Rosie’ and ‘Fourteen Carat Mind’ gives credence to his standing in the industry. He paid tribute to the great Merle Haggard with a version of ‘Tonight the Bottle Let Me Down’, although the Hag will probably leave a greater legacy than Watson. Although he has lived in Nashville for many years the Texas drawl of his upbringing was detected when he reminisced of beating the legendary and fellow Texan Ray Price to a hit with the Dave Kirby song ‘Memories to Burn’. The two hour slot allocated for Watson also saw a guest appearance from Jerry Kilgore, who is supporting him on this short UK tour. Apart from promoting his new album ‘Telephone Texas’, Kilgore wooed the crowd with the George Jones classic ‘He Stopped Loving Her Today’. As the popular Watson departed to sign copies of his new CD, a re-recording of the hits, for his faithful following, the scene was set for the main stage to change direction and the return of San Antonio’s finest export of Honky Tonk Texas country rock ‘n roll, Two Tons of Steel. This four piece band spend fifty one weeks of the year plying their trade around the dance halls, honky tonks and music venues of south Texas but having been plucked out by promoter Chris Jackson for some international exposure, are now making their third straight pilgrimage to the festival. They warmed up for their main stage slot with a late night Saturday blast in the sound flawed George Stephenson Hall and hit the straps running the following day by opening with three songs from their excellent 2009 album ‘Not So Lucky’. The title track of this album, ‘Cryin’ Eyes' and ‘Wanna Dance’ immediately got the enthusiastic crowd, swelled by visitors from the rockabilly dominated Alpha Stage, going. The fast pace rarely relented over the hour and a quarter set with the crowd participation number ‘I Wanna Be Sedated’ and the very appropriate for elements of this alcohol fuelled festival 'Bottom of the Bottle , both proving popular. Lead singer/guitarist Kevin Geil did slow things down with the sentimental number ‘You Know’ but this was only a temporary reprieve as normal service returned with a sinew bursting version of fellow Texan, Buddy Holly’s ‘Not Fade Away’. These guys are fast becoming festival favourites and a 2013 return would prove to be a popular move again. This annual immersion into a low regulated corporate free-festival is a highly enjoyable experience and though some may consider it a little limited and slightly clichéd view of Americana music, buying into the ideals of the promotion enables a modest personal investment to be amply rewarded. After an uncertain period with the venue’s hosts, plans are already at an advanced stage for next year’s event and precedence suggests a sufficient diet of quality artists will be presented to satisfy the desire of those attending mainly for the music.